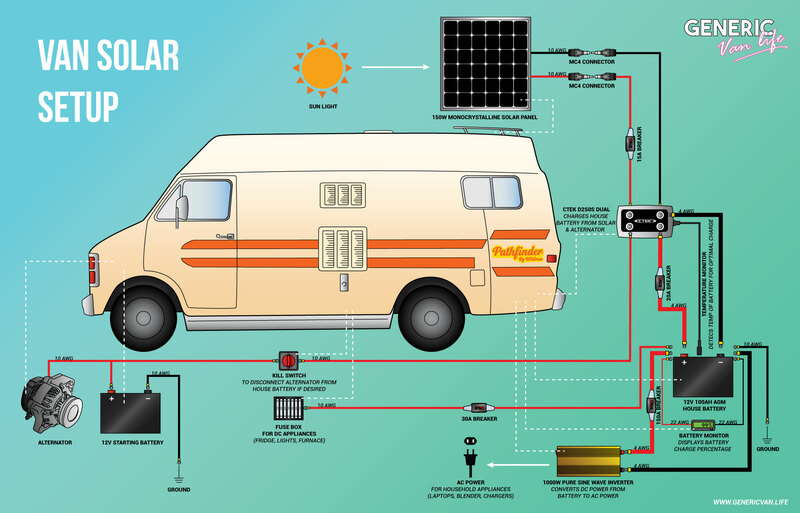 So you wanna go off-grid but reading about installing a solar system seems like gibberish? Check out our easy to understand guide for a concise video and detailed explanation with helpful tips and product links. We’ve also included a cost breakdown so you can start saving now! 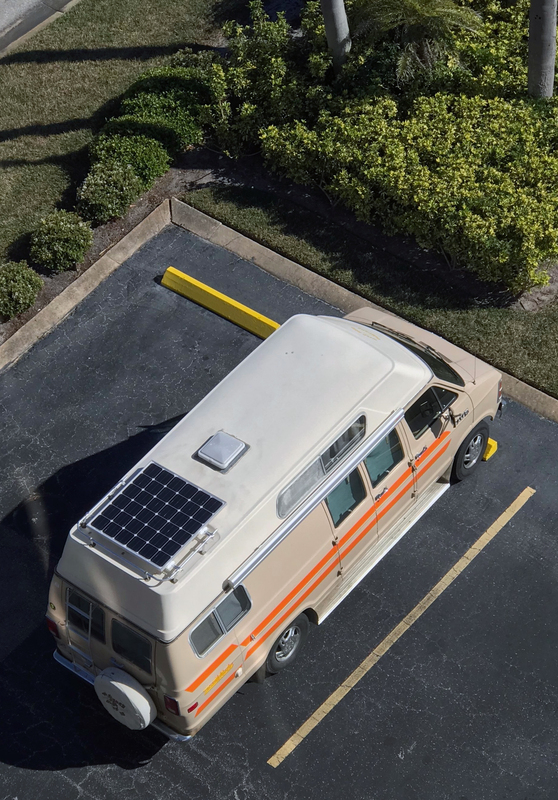 If you’re working while living on the road, you know that electricity is essential to keep your computer and other devices charged. Even if you’re just enjoying a quiet weekend in the woods, it’s nice to be able to have access to power without having to run a noisy generator. The answer? Solar power. Putting a solar system into play can seem intimidating and costly but at the end of the day, it’s a one-time worthy investment. Take, for example, our routine when we first started out. Working full days Tuesday-Thursday meant that we had to pay for a campsite or RV Park in order to plug in. Sure, you can camp out at coffee shops and other places with wifi and plugs, but that only really works when you’re around a city. This meant we were paying over $100/week as our “power bill” essentially. This got old real quick and defeated the purpose of us moving out of our apartment to get away from the bills in the first place. So we spent a while researching which components would work best for us and got the wheels turning on our solar system. FULL DISCLOSURE: We are not electricians by any stretch but had enough research and experience in our holsters to put a system into place that works great and cuts our costs down immensely. For our system, we are using a 150 watt monocrystalline solar panel from Renogy. In a nutshell, polycrystalline is cheaper but monocrystalline is more efficient. We opted for this one mainly because it’s square so it fits nicely within our roof rack. We’re fairly light power users so 150 watts is sufficient for us, but take some time to pay attention to how much power you actually consume in a day. Take note of the wattage rating on your appliances too – you’d be surprised how much power some small appliances take. Use resources like Renogy’s calculator to help figure this kind of stuff out. The panel is hooked up using two MC4 connectors (wtf are those?! read this) to join the positive and the negative 10 AWG wires that come already attached to the panel to the positive and negative 10 AWG wires that feed inside. Home Depot has a handy guide for understanding wire thickness, or read more in-depth about it here. As mentioned, we already had a roof rack so we just ran two sturdy metal beams across and used z-brackets to secure it on. 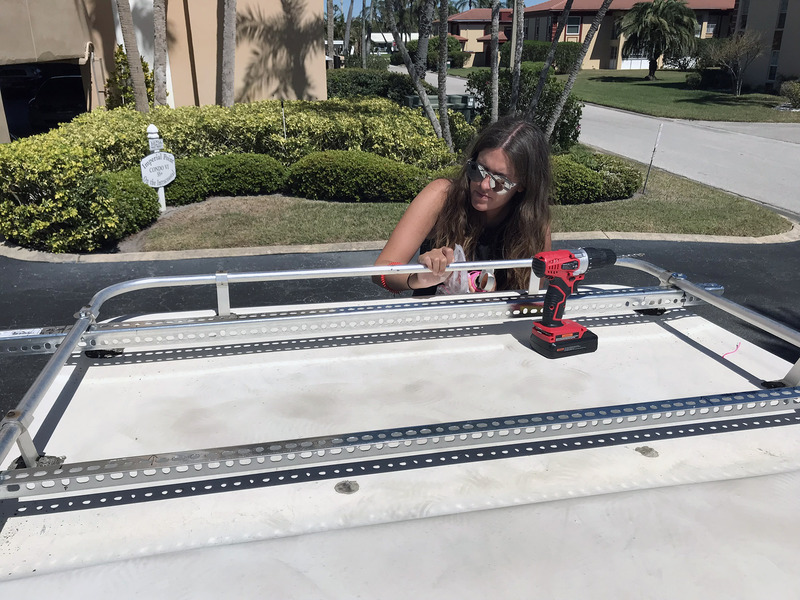 Depending on what your roof’s shaped like, you can easily mount the z-brackets directly onto the roof as well. 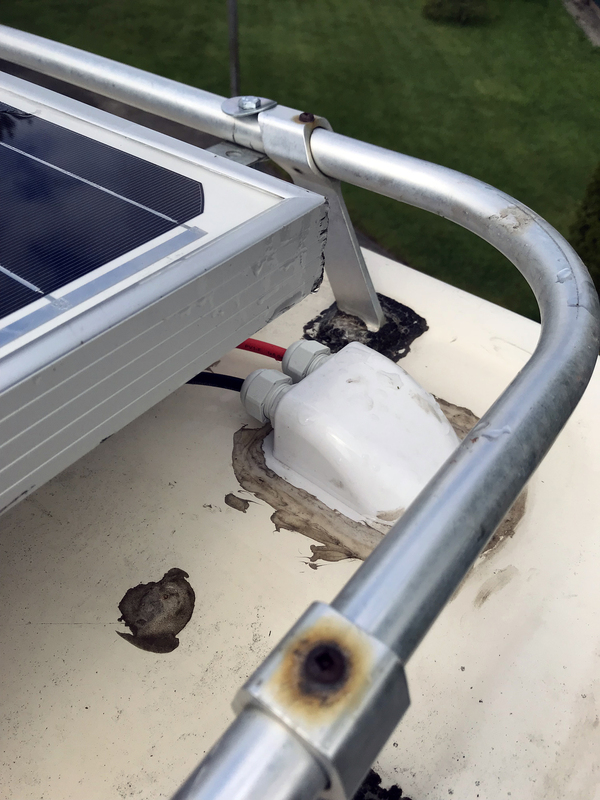 We drilled two holes in the corner of the roof and sealed on a little cable hub to feed the wires through while keeping it water-tight. On the positive wire, we’ve used a 15 amp breaker but you can also use a standard fuse. The breakers are a little more expensive upfront but never need to be replaced. The positive wire then attaches to our CTEK box, the D250S Dual. This box is an MPPT charge controller that allows the battery to be charged by the solar panel and by the alternator while we’re driving – great on overcast days. CTEK is a Swedish company that makes some badass battery chargers for all kinds of different uses. The negative wire is also attached to the negative terminal on the box. You can definitely opt for a much simpler and cheaper charge controller if you don’t plan to incorporate your alternator. Side note: When we bought the van, we already had a 12V lead acid marine battery in the back that had a wire running directly from the alternator that would charge while we were driving. We didn’t want to cut this power source off so that’s when we discovered the CTEK box. Next, a thicker 4 AWG positive wire runs from the CTEK box to the positive terminal of the house battery. We’ve added a 20 A breaker in between. A 4 AWG negative wire runs from the negative terminal of the CTEK box to the negative terminal of the house battery. We’re using the single 12V lead acid marine battery we already had but will eventually upgrade to two 12V batteries. 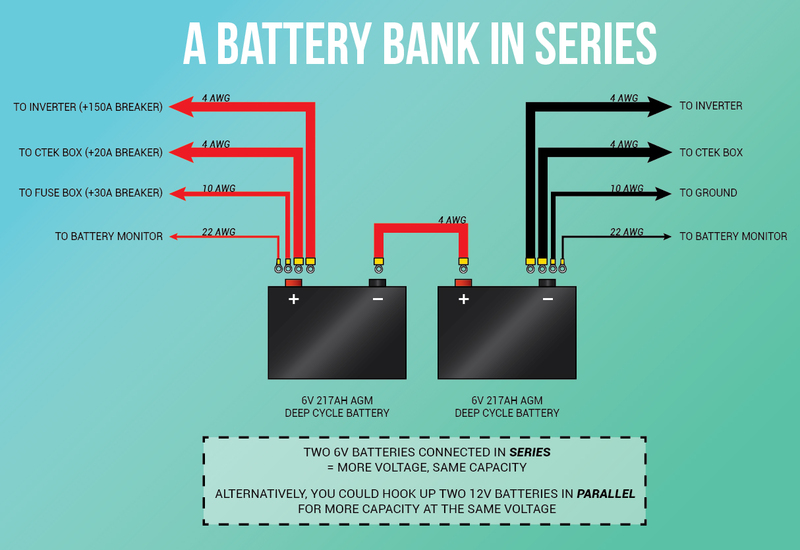 When using multiple batteries, understand series and parallel wiring. Your battery will probably be the most expensive component so picking the right battery is essential. The CTEK box is also equipped with a temperature sensor that sits on top of the battery to maintain an optimal charge. 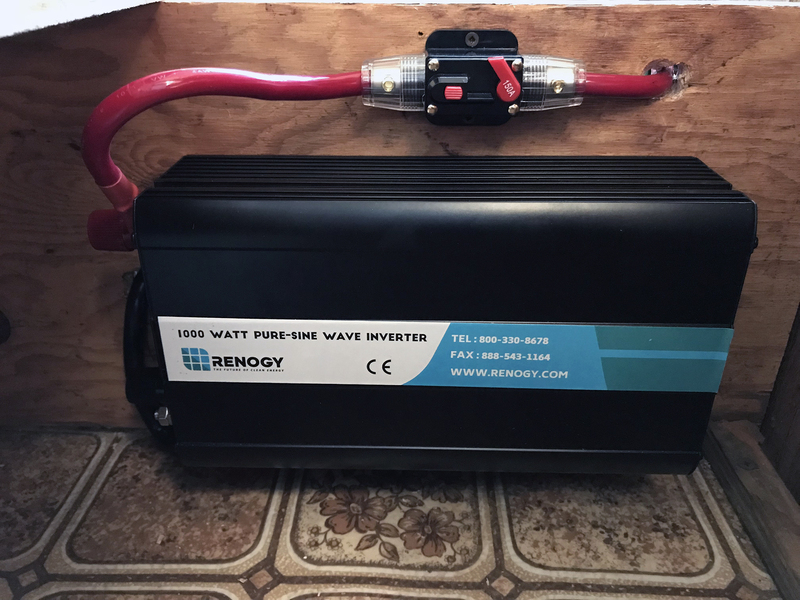 The house battery feeds a couple different things: first, a separate positive and negative 4 AWG wire runs from the battery to the 1000w pure sine wave inverter, also from Renogy. This is probably the most important area to study before you buy; understanding the amount of power your household items use when they first start up versus when they’ve been on for a few minutes is key. Take some time to understand surge power and sine waves to figure out how hefty of an inverter you’ll need. With a 150A breaker on the positive wire, the inverter converts the DC power coming off the battery into the AC power required for household appliances. You can plug stuff in directly to the inverter or run an extension cord, like we did. When shopping for inverters, read lots of customer reviews because the fan in many cheaper inverters can be incredibly noisy. It’s not an area you want to cheap out on. Next, a 10 AWG positive wire with a 30 A breaker runs to our fuse box, where the fuses for all of our DC-powered appliances live. For us, that’s the fridge, lights and furnace. Again, this was part of our existing rudimentary system when the alternator was hooked up directly to the house battery so that’s why the fuses are the old school glass ones. Also, there’s a negative 10 AWG wire running from the negative terminal of the house battery to an earthing point to ground the circuit. On the final mount of the CTEK box, a positive 10 AWG wire runs all the way to the alternator and starting battery in the front. Here, we’ve put a killswitch in between if we ever want to cut the power from the alternator and rely solely on the solar panel. And of course, there is the existing negative 10 AWG wire grounding the starting battery as well. Finally, the battery also has thin 22 AWG positive and negative wires running to a battery monitor that allow us to see the charge percentage and how many volts it’s getting. SO HOW MUCH DID IT ALL COST ANYWAY? Breakers – we paid for 4 @ $13 each = $52. Using regular fuses would definitely cost less but always have a few extra on hand. *Note that this pricing is all in US dollars because we purchased everything in the US of A. We broke even in 6 weeks not having to pay for RV Parks. We now have so much more freedom to work from wherever we want to and not have to worry about reservations and fees. Taking the time to thoroughly research which components fit your needs and budget is well worth it. 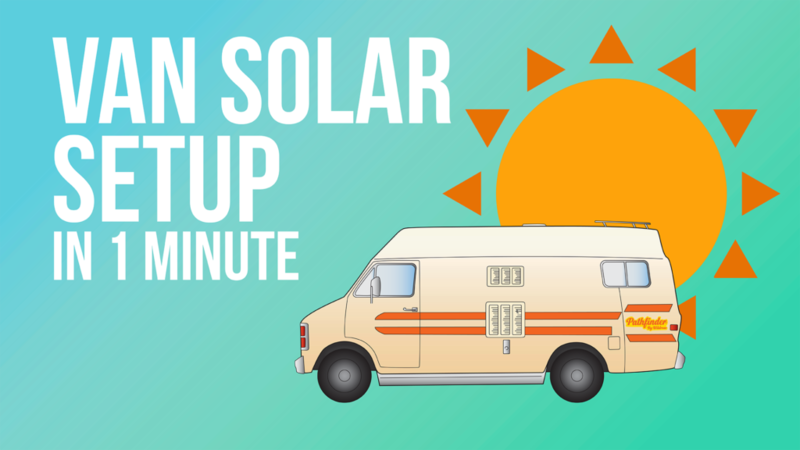 Hopefully this helps anyone looking to add a solar system to your van or RV…it’s not as scary as it may seem! Download our visual guide here. Feel free to shoot us a message or leave a comment below if you have any further questions or need clarification on anything. This post is jam-packed with helpful links so click away!! We finally bit the bullet and upgraded our battery bank! I wish we could say the whole thing still costed under $1000 but sadly, that is not true. Batteries ain’t cheap but they’re arguably the most important components to your solar set-up (other than the solar panel, of course). After careful consideration, we opted for two 6V Trojan T-105 AGM batteries. Trojan batteries are the crème-de-la-crème and are a worthy investment if you depend on your battery bank as much as we do since we boondock 100% of the time. So why these particular ones? Delaying our battery purchase allowed us plenty of time for research. We found that 6V batteries are said to discharge slightly slower than 12Vs so by having two 6V batteries connected in series, we’d have the correct voltage we need for our system (12V) while still maintaining the same capacity (217 AH). Alternatively, we could have kept our existing set-up by opting for one single 12V battery or upgrading to two 12V batteries connected in parallel to double our capacity (i.e. 100 AH + 100 AH = 200 AH) while still maintaining the correct voltage. Trojan’s “Reliant” line of AGM batteries are sealed and maintenance-free, meaning that we’re safe to keep them on their side without risking spillage as you would in a regular flooded battery. Finally, these AGM (Absorbed Glass Mat) batteries perform well in colder temperatures, unlike gel batteries which were our other option. So far, we’re noticing a huge difference in battery life and with it being winter, this has been incredibly helpful in allowing us to run the furnace for longer and using the lights since it sadly gets dark before 5PM. If all this battery jargon is still a bit confusing, check out Trojan’s guide on where to get started when choosing the best battery for your needs. We bought our batteries at a battery store in Vancouver because we didn’t have an address to ship them to but they are available on Amazon as well. So what’s our grand total at now? We paid $884 CAD (including core charge + 12% BC tax) which is about $660 USD. This brings our grand total to $1543 USD. If you’re in America and can buy them on Amazon, it’ll set you back $476 for two, amounting to $1359 USD total. Like the graphics in this video and post? Keep The Internet Busy can help you build cool stuff for your website too! I'll be looking forward to a report in a year or two. I switched back to a generator on the rare occasions that just normal driving doesn't keep me topped off. Parking in the shade during hot weather is also a huge added benefit. Any generator can be extremely quiet with a good muffler. $99 inverter generator, $17 muffler, $29 AC powered battery charger, $20 relay, and under $20 junkyard batteries for me these days. Interesting! The extreme heat isn't a huge issue for us in Canada so we're hoping the solar will work out well for now. Do you top the batteries off with distilled water? 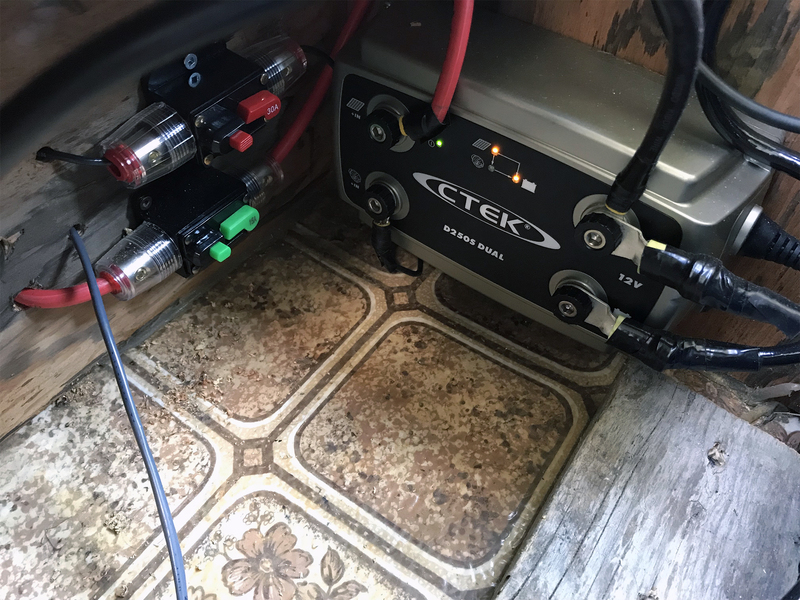 Does the CTEK (40-186) D250SA work as an isolator or do you need to have a kill switch when parked to not drain the start battery? Wonderful to see your helpful writings. Wonderful to see the concise information. Thank you so much for this share! I've researched a lot but found minimal information on a dual charge system. You managed to answer most of my questions in a 10 min read time than the past week of research!